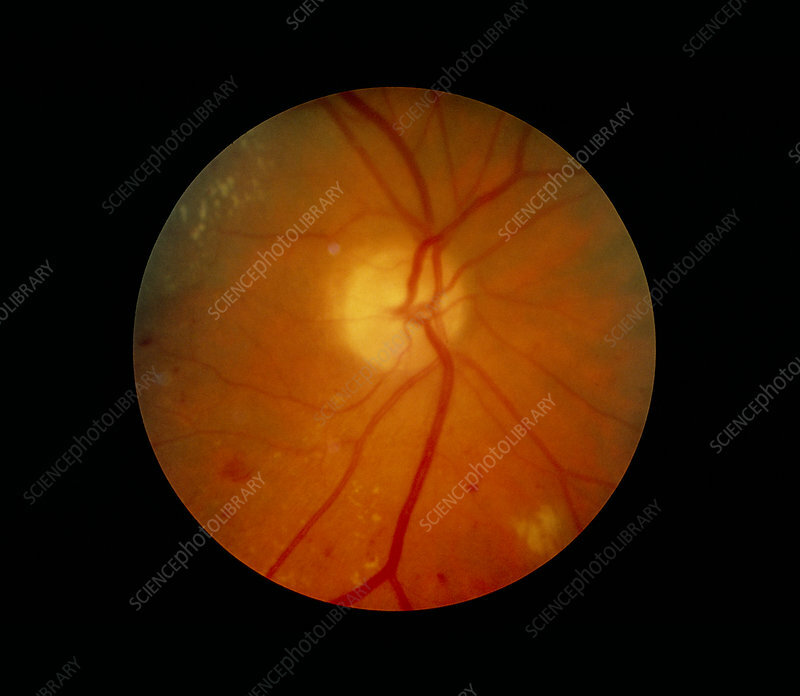 Diabetic retinopathy: fundus camera image of the retina of the eye in a case of moderately-severe diabetic retinopathy, the damage to the blood supply of the retina that occurs as a complication of diabetes. Diabetic retinopathy is the result of blockages in capillaries and small arteries (arterioles) with a resulting reduction in blood flow and cessation (non-perfusion) to some areas of the retina. Also, an increase in the permeability of blood vessels underlies the formation of haemorrhages, fatty exudates (yellow areas) and oedema (fluid accumulation). Retinopathy impairs sight & in severe cases leads to blindness.